There are several wonderful places to visit around Lisbon, less than 1 hour away, that are definitely worth discovering. To visit those places you should have a car. Although you can also find public transportation or tours that take you there, if you want to explore at your own pace and move freely, to have your own car is the best option. If you fly to Lisbon, you can rent a car online or pick one at the airport. 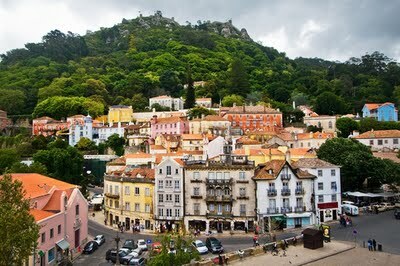 Sintra is in my opinion one of the most beautiful places in Portugal. Things to do and see in Sintra: Historic center, Moorish Castle, Pena Palace, Quinta da Regaleira (don’t miss this one, and if possible take the guided tour! ), eat Travesseiros in Piriquita pastry shop. Coming back from Sintra to Lisbon you can take the long way, heading to the Praia das Maçãs beach and then follow the road along the coast, which is very nice with some viewponts over the sea. That way you will pass also by the beach of Guincho (very beautiful with dunes and surfing atmosphere), ant the villages of Cascais and Estoril that also deserve a stop. A good option if you are looking for a special place to lunch, is about 6 kms after Praia das Maçãs going on Guincho direction, you have a restaurant that is very good with great grilled fish, in a small and beautiful beach called Praia da Adraga. When driving from Praia da Adraga to Guincho, you can take a small detour to visit Cabo da Roca, which is the most occidental point of Europe, a cliff over the sea with a lighthouse. You can stop to say you have been there and has a nice view over the Atlantic Ocean! If the weather is good, these are the best beaches near Lisbon. Cross the 25th April bridge headed south and you find indications to Caparica. I recommend you go to the beach of S. João da Caparica. Once you arrive to town there is a light on the main street and you shall turn to the right, after a few roundabouts you will see indications to the beach. This beach has a private parking area, that costs approximately 3€, but the advantage is that it is less chaotic to find a place to park. There are some nice beach bars there, like Pé Nu or Bicho d’Água. Another option, also in Costa da Caparica, is when getting to town to go to the left side at the light, and then make around 5 kms, and you will find several beaches on your right side. On this area the one I recommend is the Praia da Morena beach, which has a very cool beach bar called Borda d’Água. The only disadvantage of going to this side is that during summer where weekengs, when there is many people, the road can be collapsed with too many cars and parking can be an adventure. But on the upside, those beaches are very beautiful and more “wild” because they are farther away from town. When leaving Lisbon heading south, after crossing the 25 Abril bridge, instead of going right to Costa da Caparica, keep straight ahead and follow the indications to Setubal (30min). In Setubal you can catch a ferry boat to Troia, which is located in a very narrow peninsula, almost a “tongue” of sand between the river and the sea. In the Troia village itself there is not much to see, there is a marina, a casino and some hotels, but all beaches south from there are very nice. 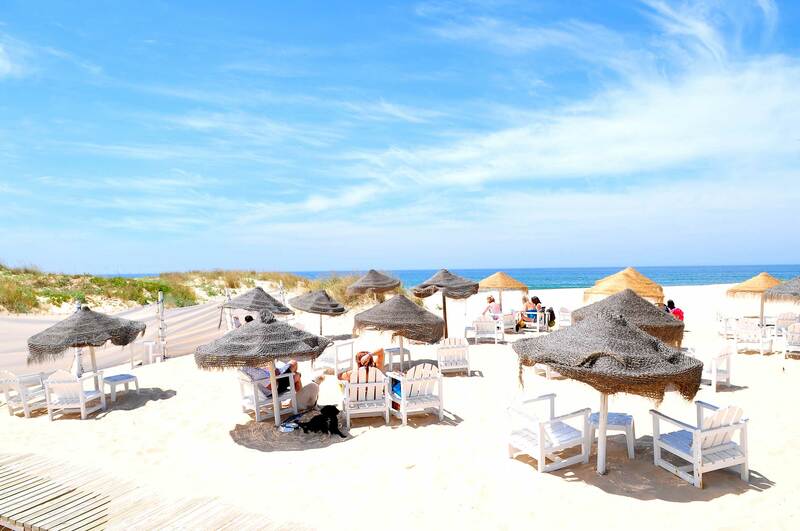 If you travel about 15 to 20 km you will find the incredible beaches of Comporta and Carvalhal, where you can enjoy a good beach day if the weather allows, and if not you can enjoy some white wine with clams. When coming to Troia or when heading back, you can make a detour on the route between Lisbon and Setubal, and go to Sesimbra. It is a nice fishing village with a castle, and also many restaurants where you can find great grilled fish and seafood. A great restaurant is the Casa Mateus where you can try some delicious rices and fish.